How long did it take you to write MAID? Writing and working on a book are similar actions to me. When I worked as a freelancer with a newborn and active seven-year-old, I’d spend all day thinking over an essay or article, taking notes here and there, then write it all out at night in a matter of minutes after the girls were asleep. This book was written in the same way, just on a much larger scale. After spending almost a year planning it through perfecting a proposal with my agent, the actual writing process was pretty quick. A friend of mine suggested going straight through–start to finish without looking back or editing–until I was done, and that’s what I did. At first I tried to keep up with freelancing, then discovered, after four months, that I was a third of the way into my year to complete a memoir manuscript and had barely 15,000 words. So, I buckled down, and kept a tally of how many words I’d added to the total amount every day. Some days were only 1,000, others were closer to 4,000 or more. While the physical action of typing out a complete 75,000-word manuscript on my tiny 11-inch MacBook Air only took three or four months, I’d spent years working through the content in my head, chewing on it in my mind, mentally going over the pieces of the arc and how I would shape it into a story. Then, there came the edits, which took another three straight months of constant work, six-to-twelve-hour days, from November to January, only taking Christmas off. Whenever people ask me this question, I give them the short answer of six or seven months. That seems like a good number. How did you put yourself through college as a single mother? Honestly, I’m not sure if I consider myself all the way through college. I still have $50,000 in debt from it, so it still feels incomplete somehow. Like I’m not an owner of a degree until I’ve made all the payments and bought it outright. But I did go to class and learn enough to pass the tests and write enough to meet the page requirement on the reports and showed up in some way for the five years it took to get a degree. I received a bachelor’s in English but took as many writing-intensive writing workshops as I could. I hung out with the MFA students and got into all of the advanced creative writing classes. All of this was invaluable for becoming a professional writer, so I can say with confidence that it was worth it. Mia, on the other hand, might not agree. Those years were rough. I worked constantly. She had to learn how to entertain herself at a very young age. She was shuffled around between babysitters. I was always exhausted from staying up late to do homework. When I told her I didn’t get into the MFA program and that I was completely done with school she jumped up and down and cheered. 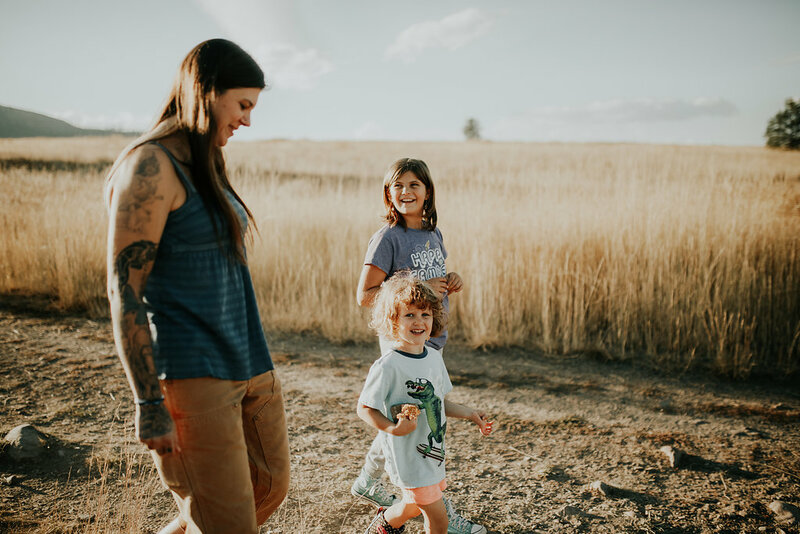 College was tedious, and often felt like a ridiculous thing to do as a woman in her 30s who had one kid and was pregnant with her second like I was my senior year. I wish it wasn’t something I had to pay so much money for, that I had to basically starve myself for, that I had to share a bedroom with my daughter for. To answer the question on “how,” I guess I registered, I took out massive amounts of loans, I applied for a Pell Grant, scholarships, and all the government assistance I could, and worked part-time cleaning houses whenever I could. And I showed up. I kept doing that until they told me I was done. How does Mia feel about all of this? Mia has always enjoyed the fame of having her picture in various publications and is pretty thrilled to have a book written about her. But she’s only 11 and has no idea what any of that means on deeper levels that it does to me. I hope she continues to enjoy this journey with me, being the muse of most things I write about. Our beginnings defined me in ways I’ll maybe never know, and I’ll always feel the need to process it somehow by writing about it. Maybe she will, too. I hope so, because I’d love to read it. With a certain amount of determination, insanity, and addiction to drama, it is possible to gross a few thousand bucks a month creating and editing content for websites and magazines. I started freelancing right out of college, so I didn’t make a leap from a full-time job with benefits and markedly one that had normal business hours. Not only had I been a student, I’d been self-employed as a maid, so I was very used to scraping by and working whenever I could. Everyone’s starting point is different, of course, as is their needs in how much income is required to pay the household bills, taxes, and health insurance. Perhaps luckily for me, I worked my way up from a place of having ten bucks in my account and wondering if I’d have to sell my truck to pay rent, so any type of gig I scored that fit in the realm of writing and editing words was some sort of celebration to secure. You find work by googling for it, by signing up for email newsletters of others who want to share their knowledge. There are lots and lots of them. Start with the Morning Coffee Newsletter through Freelancing.com, Upwork, and WhoPaysWriters. Ask local businesses if they need new content for their website. Email websites and ask if they’d like to publish an article or essay you’ve written. It starts out like this. You toil away at finding work, then jump up and down like nobody’s business when you get a “yes.” That’s where the determination, insanity and drama comes in. I try very hard to be funny on Twitter @stepville. I also try to take artsy and sometimes silly pictures and put them on Instagram @stepville too. 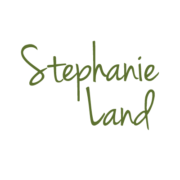 My public Facebook page is /stephanielandwriter. What was the inspiration for MAID? MAID began as an essay I wrote in college. Disregard whatever image that conjures in your mind. I was in my third year, in my first writing workshop, taught by David Gates, a real writer, and I had to come up with ten pages to submit to the rest of the class, most of whom were ten years younger than me and whose essays could be summed up with one of two titles: “My last year of high school and my first year of college” and “The year I went abroad.” My classmates didn’t know what to say about an essay written by a 33-year-old single mom who had to scramble from scrubbing toilets to picking up a kid at preschool, her car breaking down along the way. To quell the silence, David Gates read the paragraph about the Sad House out loud to the class. He’d never done that before. When he finished, he leaned back, shook his head, chuckled, and said “Solid gold, man. Solid gold.” I worked on the essay some more and showed it to another writing instructor, Debra Magpie Earling. We met at a coffee shop. I handed it to her to read, got up to get a cup of coffee, and when I came back she was sitting there, her hand on her mouth, completely enthralled. When she finished reading, she looked up and said, “Stephanie. This is going to be a book.” I worked on it some more, and used it to apply for the college’s MFA program and got rejected, and mostly forgot about it until I needed to submit something for an ad asking for essay submissions by Vox Media. “Dear Editor,” I wrote in my email. “Here’s an essay I wrote when I used to clean houses,” and I copy/pasted in the paragraph David Gates smiled about in class. They paid me $500 for it, which at the time was the most money I thought I’d ever get paid for an article. The morning it went live, my website was getting traffic that included about 4,000 hits an hour, and people kept contacting me through it. Some thanked me for writing it, since they, too, grew up with or were single moms who cleaned houses or hotel rooms or worked a disgusting job for barely any pay. Some called me vermin or a cockroach for publishing an essay about what I saw. In the midst of it all, an agent contacted me, asking if I had a book in the works. Exactly eleven months later, that book had a contract to be written.